This is an English locational name from either of the places so called in Cheshire or Lancashire. Dutton in Cheshire is first recorded as "Duntune" in the Domesday Book of 1086 and that in Lancashire as "Dotona" in 1102. They share the same derivation and meaning, which is "Dudda's village" or "settlement", derived from the Old English pre 7th Century personal name "Dudd(a)" with "tun", an enclosure, settlement or village, later a town. 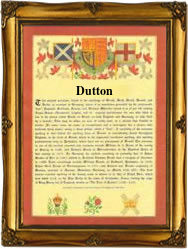 The family of Dutton whose ancestor is recorded below have been established at Dutton in Cheshire since the 11th Century. Hugh de Dutton was lord of the manor during the reign of Henry 11 (1154 - 1189). The marriage of Thomas Dutton and Judith Jennings is recorded in London in 1579. Among the recordings in Lancashire is the marriage of Edmund Dutton and Alice Teeller on February 2nd 1643 at Warrington. The first recorded spelling of the family name is shown to be that of Odard de Dutton, which was dated 1086, The Domesday Book, Cheshire, during the reign of King William 1, "The Conqueror", 1066 - 1087. Surnames became necessary when governments introduced personal taxation. In England this was known as Poll Tax. Throughout the centuries, surnames in every country have continued to "develop" often leading to astonishing variants of the original spelling.